Will Obama's new overtime rules actually hurt workers? 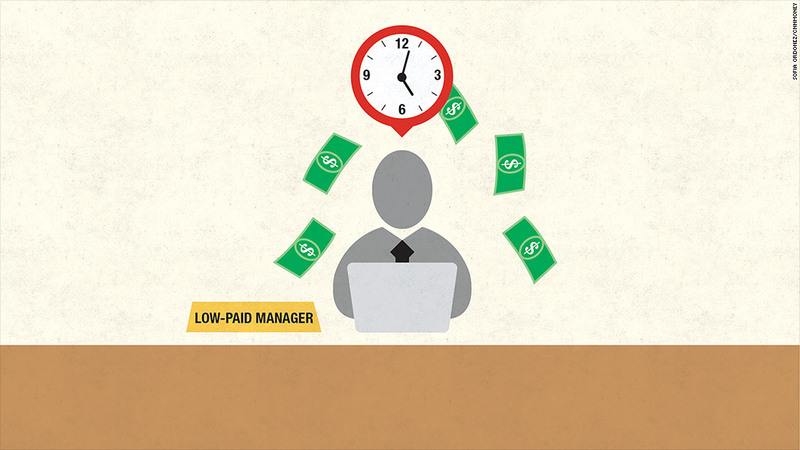 A new federal rule that expands the number of workers eligible for overtime pay means employers will have to pony up more money -- in payroll, administrative and legal costs. They're not happy. And, they warn, workers won't be either. That's a stark contrast from the message put out by the Department of Labor, which created the rule to provide a better deal for underpaid, overworked salaried managers and other "white collar" employees currently exempt from overtime pay. Under the new rule, everyone making less than $47,476 will be made eligible for overtime automatically, regardless of their job duties. Advocates say the rule will provide more money or more free time for the employees affected: They'll either start to get overtime pay or a raise to put their salary above the new threshold. Or employers won't let them work any more than eight hours so they don't incur overtime costs. But employers opposed to the changes are telling a different story. Pay won't be better: Employers say many workers actually won't get paid any more than they are today, and may in fact be paid less. That's because salaried workers who are converted to hourly workers will only be paid for the hours they work. In some weeks that may be less than 40 hours if, for example, they have to leave early for a doctor's appointment. Or in the case of someone who customarily works 45 hours a week, he won't make a dime more if the employer effectively lowers his base pay to offset the overtime that will be owed. Career prospects may be hurt: Newly overtime-eligible workers may lose out on opportunities to expand their careers, said David French, a spokesman for the National Retail Federation. Consider an assistant fashion buyer for a retailer. Her employer may no longer be willing to send her to a fashion show in another city or country because her hours would be long and it would be hard to track which involved actual work. Networking and training opportunities after an 8-hour day could also be curtailed, said Lisa Horn, the director of Congressional Affairs at the Society for Human Resource Management. And an employer may start to hire fewer managers. "Today's overtime rule will reduce valuable middle management positions ... [It] breaks the basic American bargain: If you're willing to work until the job gets done, you can quickly climb the career ladder," said Alfredo Ortiz, head of the Job Creators Network, a business trade group. Those affected will feel demoted: Those who have previously been treated as exempt from overtime will now have to track hours worked, break times and meal times. "It is absolutely seen as a demotion. We hear it all the time," said Horn. And those starting out at $35,000 or $40,000 may remain hourly workers far longer than planned, said Lizzie Simmons, NRF's senior director of congressional affairs. That's because once their pay comes close to crossing the overtime threshold, the threshold may go up again. It's currently scheduled to go up every three years. There will be less flexibility: Among benefits that may be lost, employers warn, is flexibility -- to attend to personal business during the day or to work from home. Workers who are used to having a smartphone and a laptop for use after hours or when they go to their daughter's soccer game may find that's no longer an option, said Tammy McCutchen, a lawyer for Littler Mendelson, a firm that represents employers. And if they do get permission to go to the game, they won't be paid for that time. Any of those things may happen. But they won't all happen to everyone. For instance, employers aren't required to convert their salaried, newly overtime-eligible workers to hourly employees. For administrative and legal purposes, it will be cleaner from the employers' standpoint if they do. But if it causes a morale problem, they might think twice. As for flexibility, companies already use time-tracking software that lets employees submit time records from a mobile device or a laptop used at home or on a business trip, said James Arsenault, director of strategic communications at Ceridian, a human capital management technology company. And in terms of career opportunities, he noted, that's more about a company's commitment to talent development and hiring the right people, not time-keeping.